lubricant giant achieves a consecutive record breaking safety performance in Sri Lanka | Welcome to Chevron Lubricant Lanka PLC. 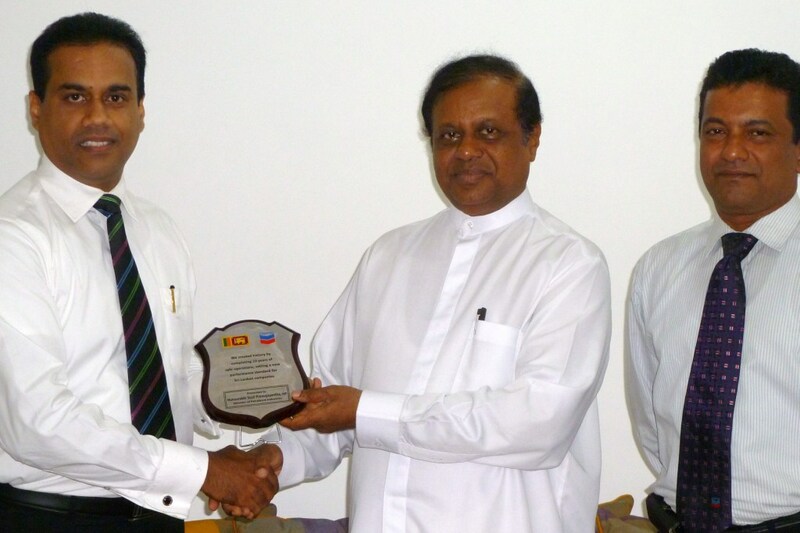 Mr. Kishu Gomes, Managing Director & CEO of Chevron Lubricants Lanka PLC recently presented a commemorative plaque to Hon. Minister Susil Premajayantha, Minister of Petroleum and Petroleum Resources, at the Ministry premises; to mark the special occasion of the achievement of '10 consecutive years of incident free operations' in Sri Lanka. The plaque symbolizes the unprecedented safety record achieved by Chevron, which sets a new performance standard for companies in Sri Lanka. The Minister expressed his appreciation for Chevron's outstanding safety record and commended the company's exemplary achievement, and contribution to the local industry. Also in photo is Mr. Wijitha Akmeemana, Act. General Manager – Supply Chain at Chevron Lubricants Lanka PLC. Chevron's plant and supply chain operation received a special commendation from the Chevron parent company for achieving 10 successful years of lost time injury free operations in Sri Lanka.